My significant other has gotten it into his head that Italian food is some kind of a cop-out. I don’t know where it comes from, but I’m pretty sure when he hears Italian food, he thinks boil pasta, throw canned tomato sauce on top, possibly with some meat or cheese to finish the dish and you’re done. As a result and much to my chagrin, I have a very difficult time convincing him to go out for Italian food. In order to finagle a dinner at Osteria Mozza, I had to use my birthday dinner – no input from him, all my choice. Knowing I wouldn’t be able to convince him to try the pasta tasting menu (everyone at the table has to participate) I very carefully selected one pasta dish to add to the selections for the evening – fresh ricotta and egg ravioli. It was mentioned in almost every review (both professional and in the blog and Yelp worlds) and I generally fall in love with any dish that serves up a runny egg yolk. In this case that yolk comes from boiling ravioli with a whole egg yolk inside, just barely poaching the yolk in the process. At the time, and still to this day, Osteria Mozza is not the easiest Saturday night reservation to secure. We ended up with a table at 10pm. Not a problem for us as we like to eat on the late side, but a huge problem for the fresh ricotta and egg ravioli. They had run out. It’s a popular dish and eating on the later side of things means risking the kitchen running out of favorites. Of course it was still an amazing meal watching Nancy Silverton at work behind the mozzarella bar and eating the tenderest pasta I have ever been served. Even the “Italian food is a cop-out” boyfriend was impressed. Though in spite of the great meal, a strange, insatiable craving was set off in me for pasta and runny egg yolks. Thank goodness for the internet. 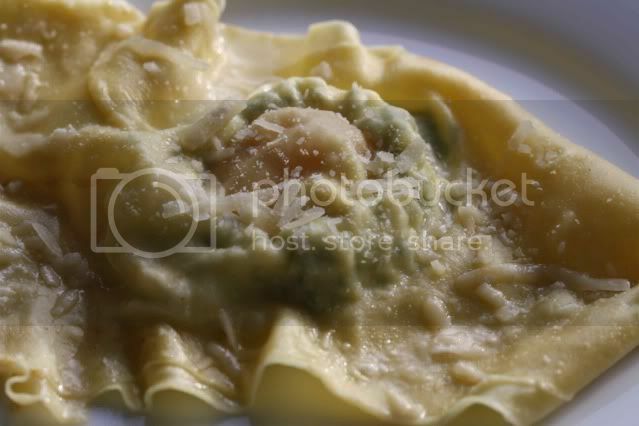 Batali + egg yolk ravioli = exact recipe I needed to satisfy that craving at home. Of course my homemade pasta can’t rival that found at Osteria Mozza, nevertheless the ricotta filling with runny egg yolk was completely satisfying. If you can find it, do use sheep’s milk ricotta. If not, cow’s milk is a fine substitute. Definitely make your own pasta dough as you’ll need its quick cooking time to make sure your egg yolk doesn’t overcook and become hard. Two of these huge raviolis were enough per person, but if you’re hungry, maybe plan for three. They can be a bit addictive. Combine the parmesan, ricotta and spinach. Season to taste with nutmeg, salt and pepper. Start with a third of the pasta dough and roll it out to the thinnest setting on a pasta rolling machine. From the thin pasta sheets, cut 12 squares about six inches in length (roll out more of the dough if you need it). Set six squares on a tray dusted with flour and cover with plastic wrap. 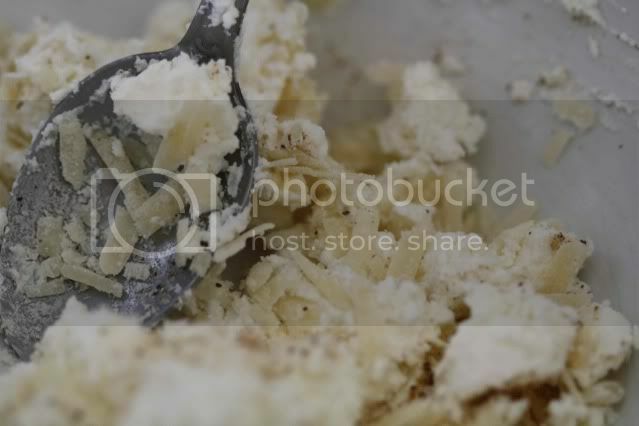 Divide the ricotta mixture evenly between the remaining six squares, placing it in mounds in the center of each square. Use the back of a spoon to create a well for the egg yolk in each mound. Carefully break an egg into a small bowl, and transfer one yolk and a bit of white into the center of each well. Don’t break the yolk! Repeat for the remaining squares. Cover each filled square of pasta with an unfilled square, and press the edges together with fingers to seal. Bring a large pot of water to a boil and salt generously. Melt the butter in a large sauté pan. Gently lower each ravioli into the boiling water to cook for two minutes. Remove from the water and place into the sauté pan with the butter. Add a generous grating of parmesan, sauté for one to two minutes and serve. Place the flour in a mound and make a large well in the center. In a separate bowl, whisk the eggs and olive oil together. Pour the egg mixture into the well in the flour. Slowly start incorporating the flour into the eggs without breaking the well. The mixture should start to come together when half of the flour is incorporated. When all of the flour is incorporated, start kneading the dough, adding more flour as necessary to keep the dough from sticking to your hands. Knead the dough for about five minutes until the surface is smooth and just the slightest bit sticky. 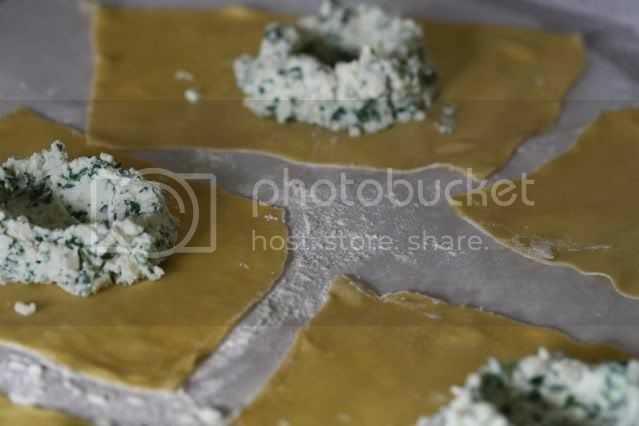 Flatten the dough into a disc shape, wrap with plastic wrap and set aside at room temperature for 30 minutes before rolling out for the raviolis. Oh wow!! I believe you that this is oh so good!! It looks amazing!! I love the egg yolk in the middle. I sooo need to make this! That looks GREAT! I love the richness of the egg yolk, and when you poke it with your fork the way it runs all over the rest of your food. Nice work! This is my kind of Italian. Exquisite!!!! This really is a thing of beauty. How absolutely lovely, thank you for sharing it with us. wow...this looks delicious! im going to have to try it soon! I am so impressed! This looks like such a delicate pasta. Great job! 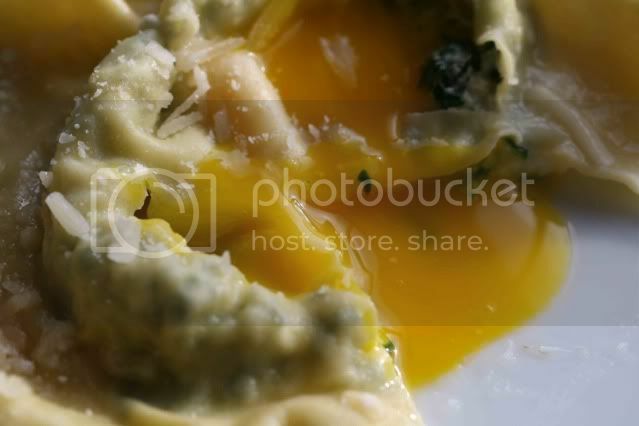 I never would've imagined eggs inside of pasta, very interesting. Much to my wife's chagrin I go the same route as your significant other. She always wants to go out for pasta and I always say why order what we can make. I think the problem lies in the fact that she orders the same thing she prepares and then complains that it isn't as good as her own. I had this dish at Perbacco in San Francisco almost three years ago and no one has been able to tell me how they did this. Thank you! An excellent party trick. BRAVO!!! What a huge food success! Great pictures too! well, you can go ahead and color me immensely impressed. in fact, i'm bowing down to you right now. this girl has never made her own pasta, much less one requiring such finesse. bravo! Boy do those look amazing! 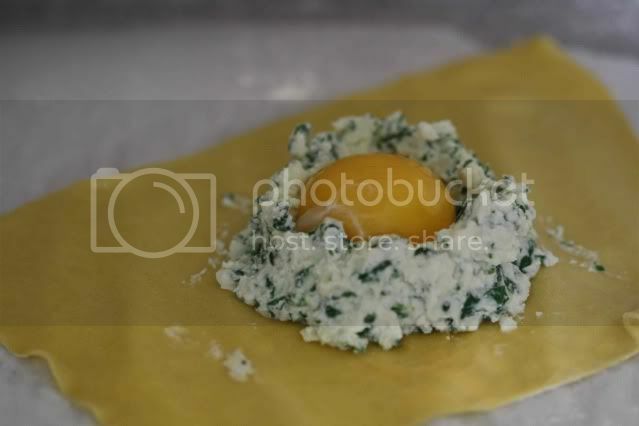 I'm a fan of the runny egg yolk as well and in homemade pasta...wow. This recipe takes my love of pasta and eggs to a whole new delightful level. Lovely photos! This looks gorgeous, very appetising and very impressive. I'm swooning along with everyone else. oh my god! This is mind blowing. I must make these this weekend.